The Every Student Succeeds Act (ESSA) gives states the responsibility of choosing at least one indicator to measure school quality or student success. 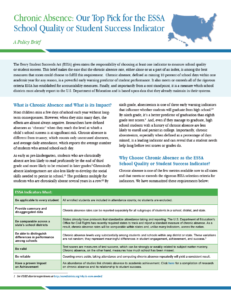 This brief, Chronic Absence: Our Top Pick for the ESSA School Quality or Student Success Indicator, makes the case that the chronic absence rate, either alone or as a part of an index, is among the best measures that states could choose to fulfill this requirement. Chronic absence, defined as missing 10 percent of school days within one academic year for any reason, is a powerful early warning predictor of student performance. It also meets or exceeds all of the rigorous criteria ESSA has established for accountability measures. Finally, and importantly from a cost standpoint, it is a measure which school districts must already report to the U.S. Department of Education and is based upon data that they already maintain in their systems. As states develop their accountability systems, they should consider combining chronic absence with other measures of engagement and school climate. Considering these options and choosing the most appropriate measures is a time-consuming, time-limited process. The Department of Education has developed a timeline from September 2016 through September 2017 and beyond to support states, education stakeholders and administrators while they develop accountability systems. The Brief includes the timeline that can help when developing plans to comply with the final ESSA requirements. As this table shows, 36 states and the District of Columbia officially submitted ESSA plans to the U.S. Education Department that included chronic absence or similar attendance measure as an accountability metric. The School Quality Improvement Index is an innovative, holistic approach to measuring how well a school supports student achievement. It is being closely watched as a possible model to comply with the new federal ESSA reporting requirements. Piloted by a set of nine districts in California, this index augments test scores with data on chronic absence, school climate, and student growth. Read more here.